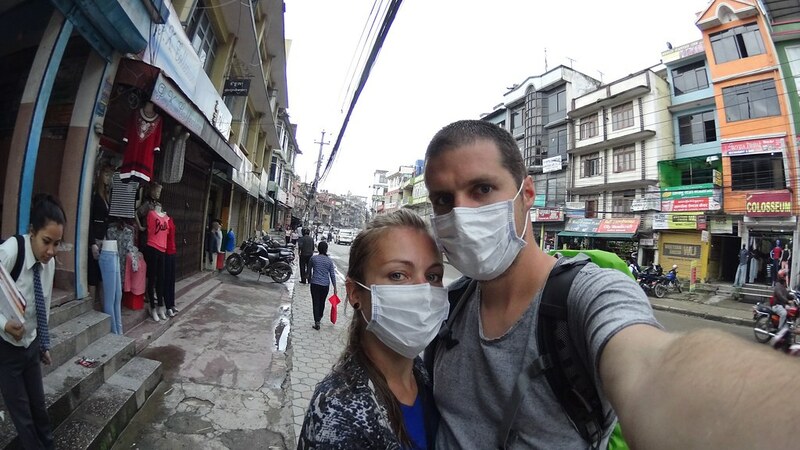 Arriving in Kathmandu was immediately an eye opener: Crossing the airport security was a joke. We keep count of many things (how many planes, how many trains we took etc.) and one of these lists is: “How many time we set off the security gate?”. So crossing the border security in the airport of Kathmandu was like: Just pay your visum, pass through a metal detector, make it beep just as EVERYBODY else and get your luggage. Whether you bring a Swiss Army knife (as we did) or a 35mm rocket launcher, it wouldn’t make any difference. 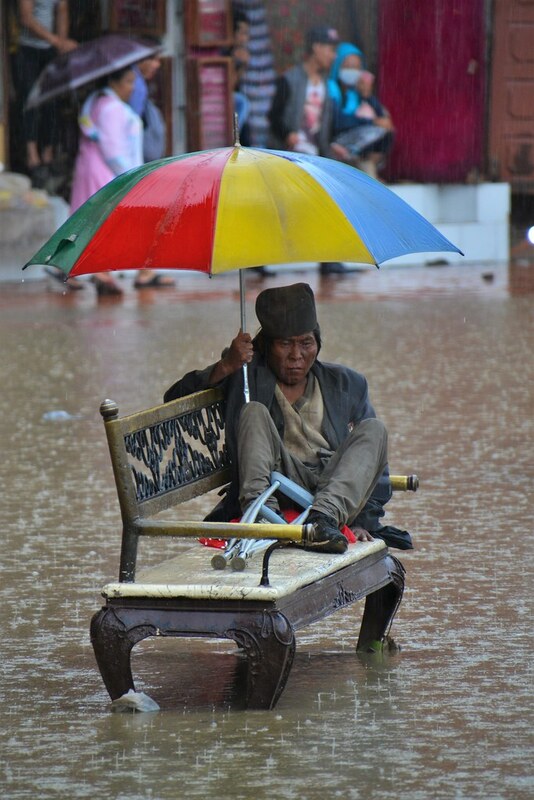 2nd eye opener: The traffic in Kathmandu: By the looks one would doubt any of the cars, motorcycles, taxis or busses will make it to their destination. There is clearly no compulsory vehicle inspection. But what definitely works on each vehicle is its horn! On the street there are no lights, no lines and no rules (you can take your whole family on your motorcyle without a helmet and even carry a goat in the meantime – as long as you blow your horn enough of course!). There are some policemen on busy intersections, but they just seem to blow a song on their wistle nobody listens to. To conclude: there is only one thing all drivers watch out for, and that are cows. 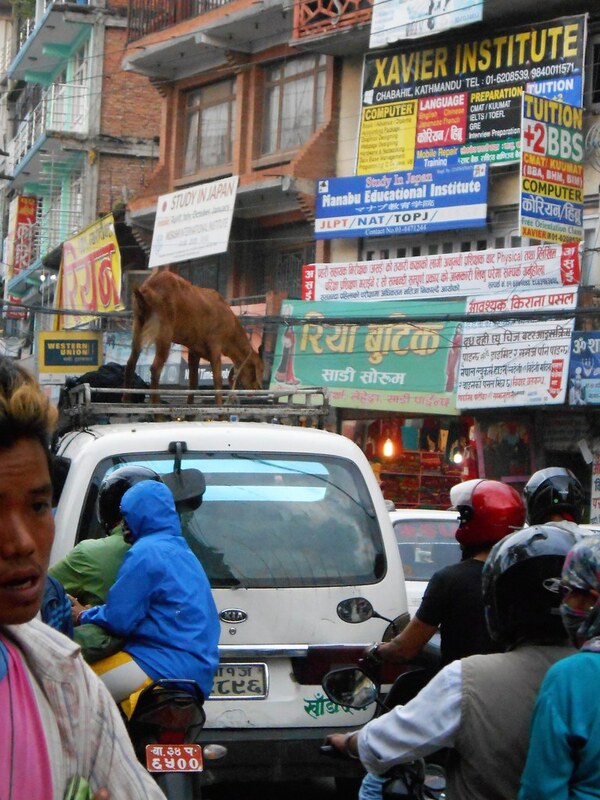 If you hit a cow with your car in Nepal, you can be thrown into jail. Eat that Australia! We immediately went to our place to sleep: Lokendra’s place who we met via Couchsurfing. If you want to experience a country we might as well do it right and we wanted to really submerge in the local community life. First evening was weird and fun at the same time. There were a lot of people: family (brothers, nephews, …) of Lokendra, people who live there, people visiting and it was Saturday (no working day – like our sunday) + in festival season, so we had all a lot of drinks. We also ate goat for the first time in our lives, with our hands and all from the same plate. The place was very very basic, but we knew that up front and we made it our own cosy room for the next 4 days. 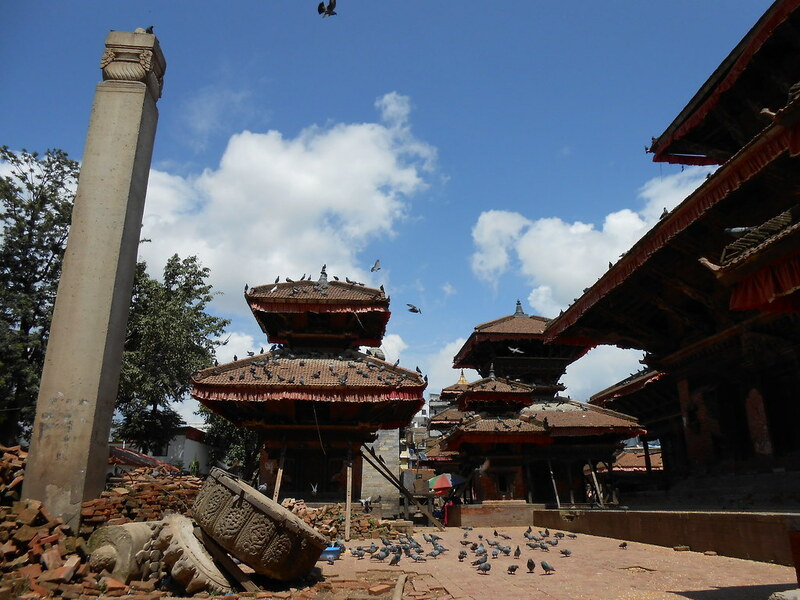 Durbar square in Kathmandu: Heavily damaged by the earth quake, but still impressive and beautiful. And … BAM our first guide we couldn’t say no to. 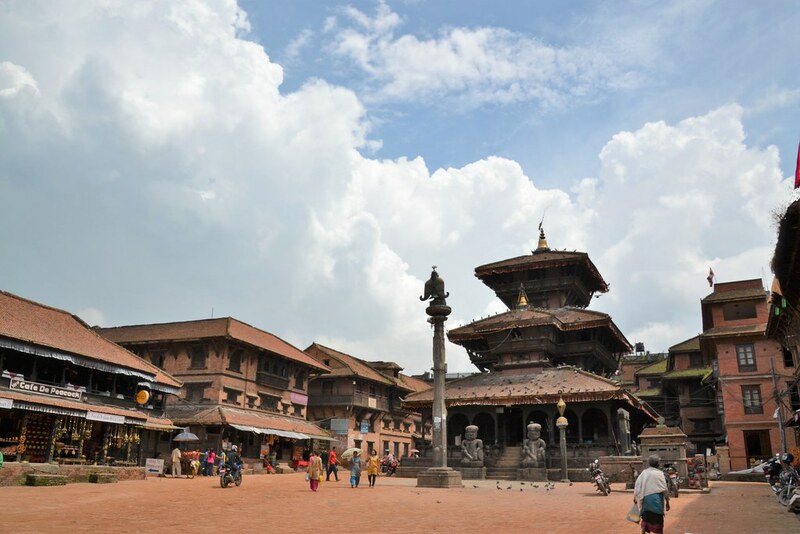 There are many Durbar Squares in Nepal: nearly every city has one since there were many kingdoms in the past before it became one Nepal and “Durbar” means palace. So it’s the place where the palace of that kingdom was located. 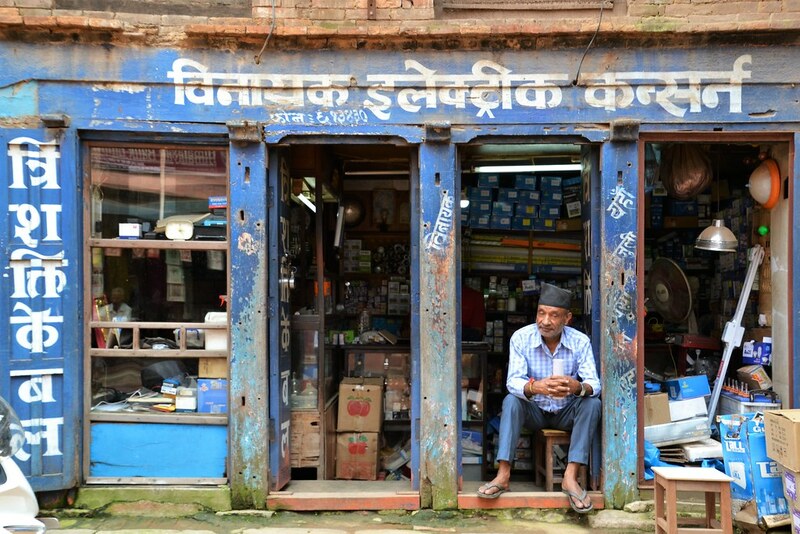 Thamel in Kathmandu: A very hectic network of small streets full of shops, restaurants, … Unfortunately none of them is free of traffic so you have to be alert for motorcycles all the time. 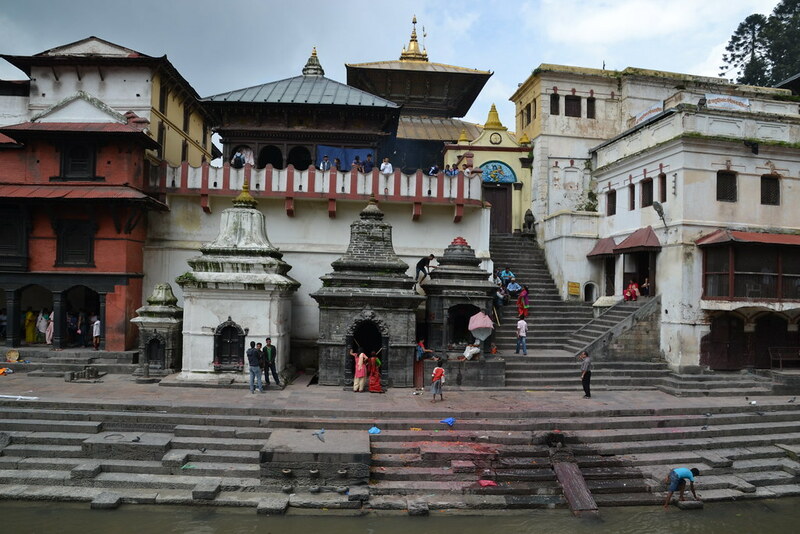 Pashupatinath: This is a very beautiful holy Hindu place where each day up to 40 bodies are cremated after a ritual washing in the Bagmati river. The ashes are thrown in the river. BAM … also here, our second guide on our hands. If you see people near a cremation site bathing in the water, it might as well be gold diggers who are looking for the jewelry of the deceased. Boudhanath stupa: The largest stupa (temple of the Buddhists) in Nepal. 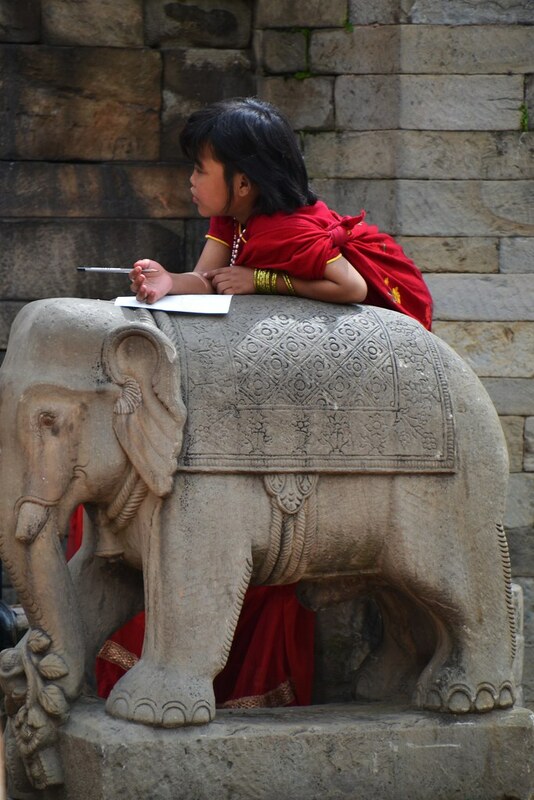 The quietness compared to the busy streets of Kathmandu was a holy relief in itself. 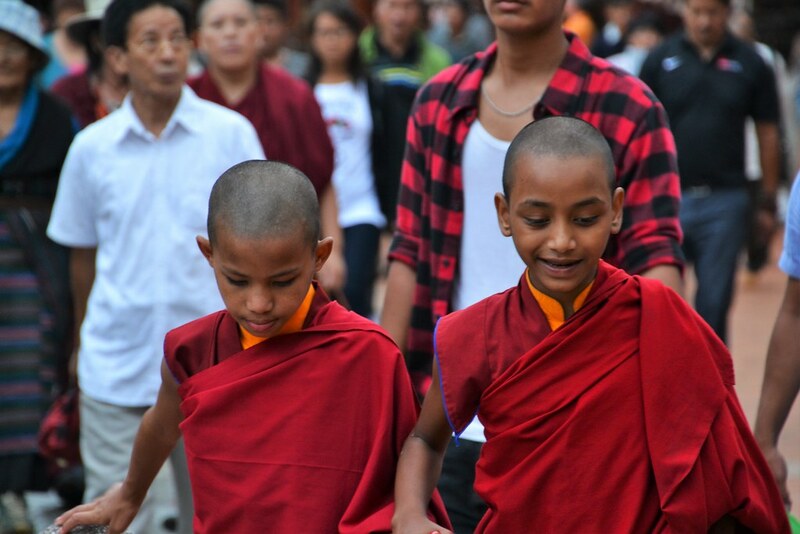 Every morning and every evening hundreds buddhists walk around it clockwise while praying. 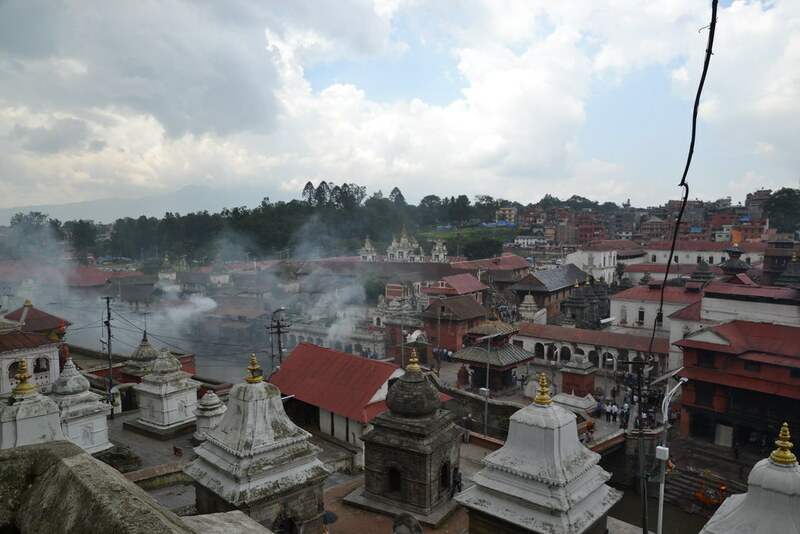 An impressive sight, even when the upper part of the stupa is destroyed by the earthquake. 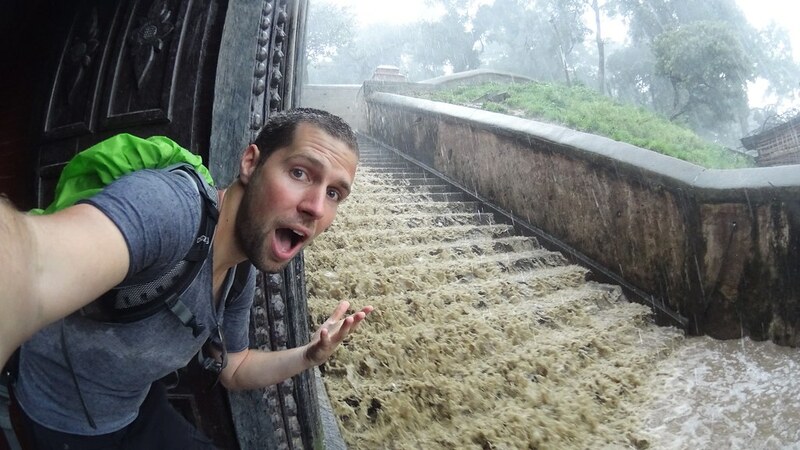 During our summer it’s monsoon season in Nepal, which we could experience when walking from Pashupatinath to Boudhanath. Suddenly a heavy rainshower hit us and taking shelter under a tree was clearly not enough, neither was a porch roof. We finally hid in a “Hindu only” temple. The one time it was allowed to enter as a non Hindu. 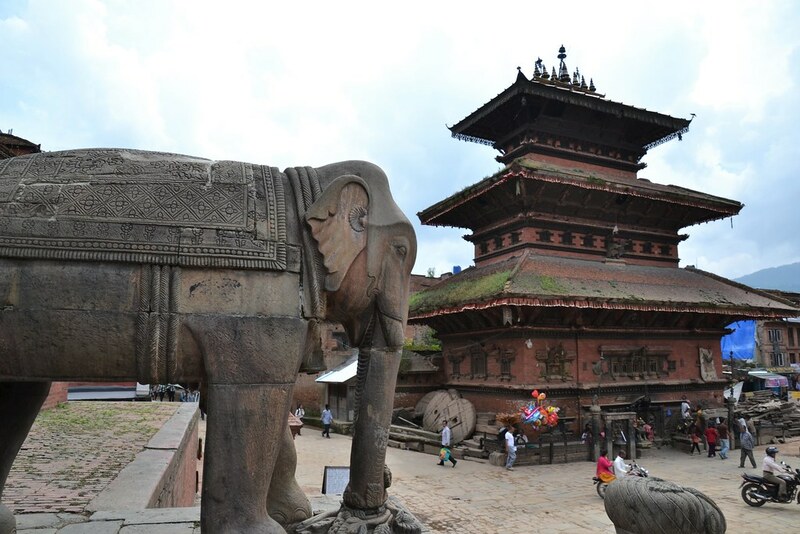 Bhaktapur: A very beautiful town with a nice durbar square (with some destruction but still worth visiting) and with the highest temple of Nepal. We really had a “WAUW’ feeling here. Furthermore, we finally succeeded not to take a guide (but we do not regret the previous guides because after all, they are really begging for tourists after the earthquake). 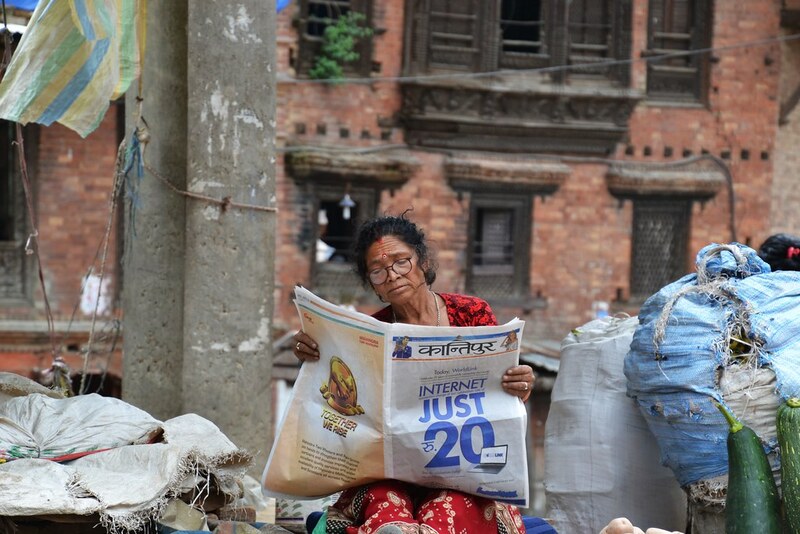 We really enjoyed observing the locals in their daily life here. 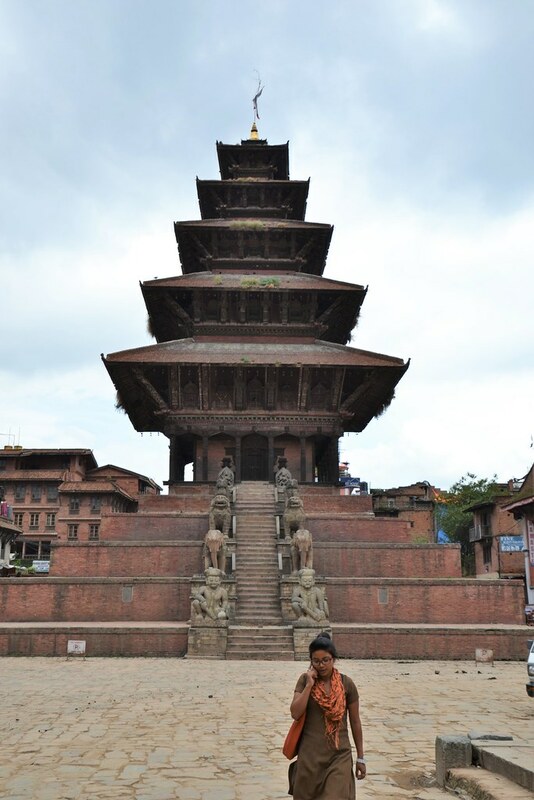 More pictures of our adventures in Kathmandu & surroundings can be found here. After these first busy days in a quite hectic city we prepared to go to the village in the hills. This made us curious and very eager to find out. Read more about this in our next blog post. Mooi reisverslag. Was de geit lekker ? Smaakt naar meer! Keep us (blog)posted! 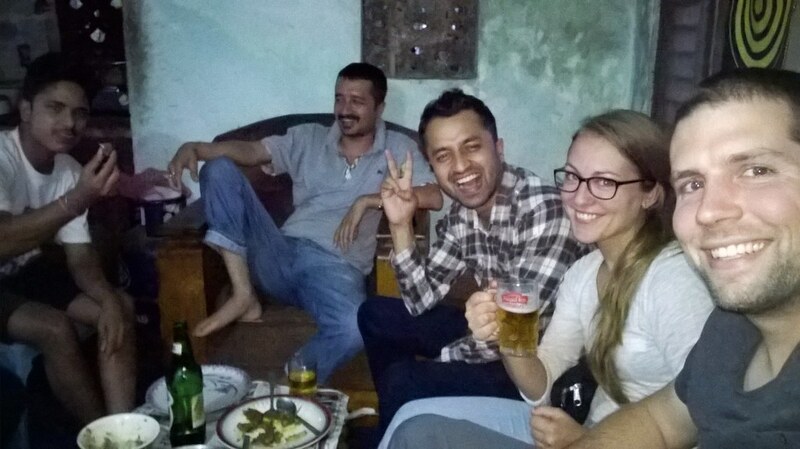 ← Benefiet BBQ Nepal: Het resultaat!